Could you please review this PR for error status and type filters? Because amp_validation_error terms now has a type in the description, you might want to delete from your local environment all of the amp_invalid_url posts and amp_validation_error terms. And then run the WP-CLI validation again. 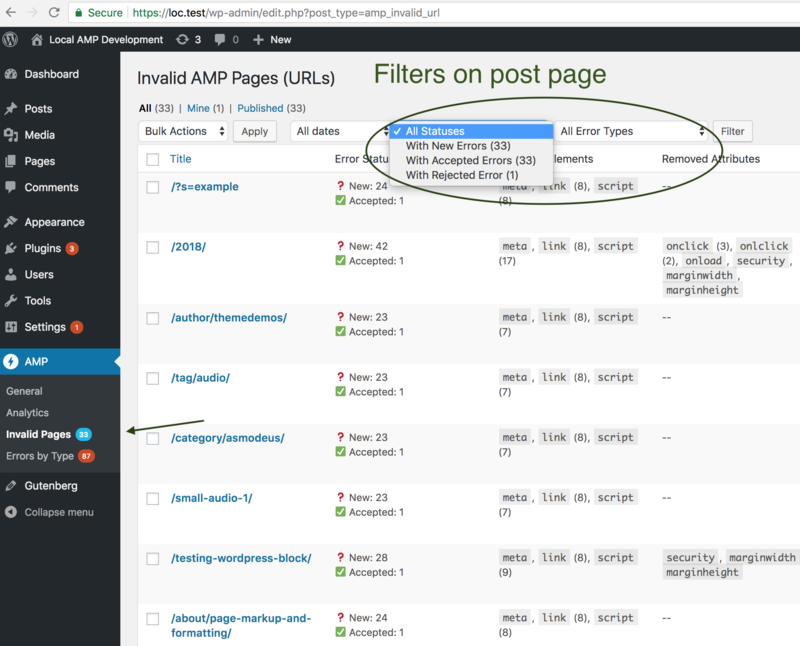 Adds status and type filters to the amp_invalid_url post (edit.php) and amp_validation_error taxonomy (edit-tags.php) pages. This modifies the existing status links from before. Applies the new 'Errors by Type' terminology from the design. 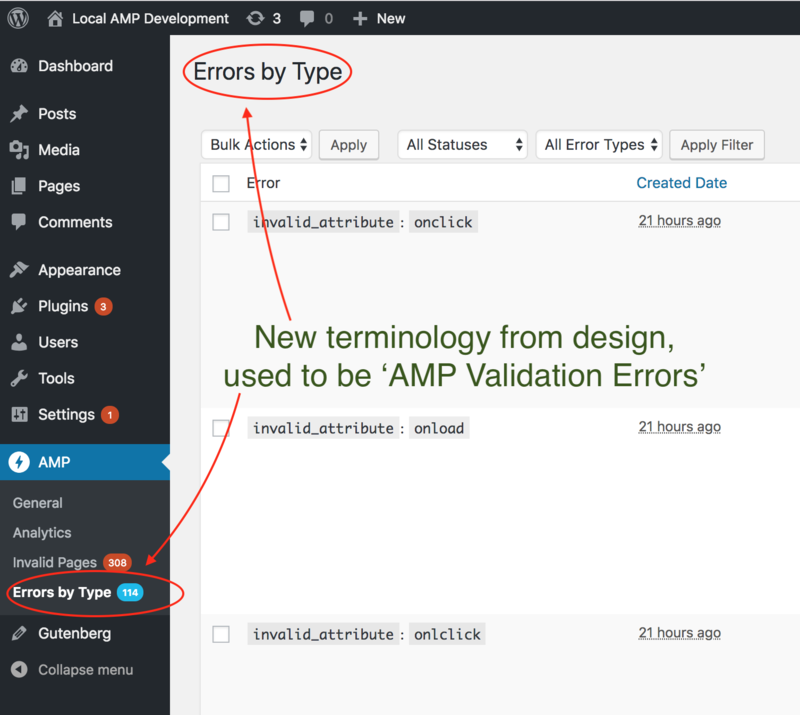 Based on @westonruter's suggestion in #1360, this adds a type to the amp_validation_error term description. There are now 4 error types, stored in the description: html_element_error, html_attribute_error, js_error, and css_error. This also needs to be a js_error if it is an invalidate attribute and the attribute starts with on. This will have JS in it, so this error code is more accurate. On Weston's suggestion in code review. so update them for the latest commit. Just realized you intend to do more on this PR before merging. to filter the taxonomy page by type. 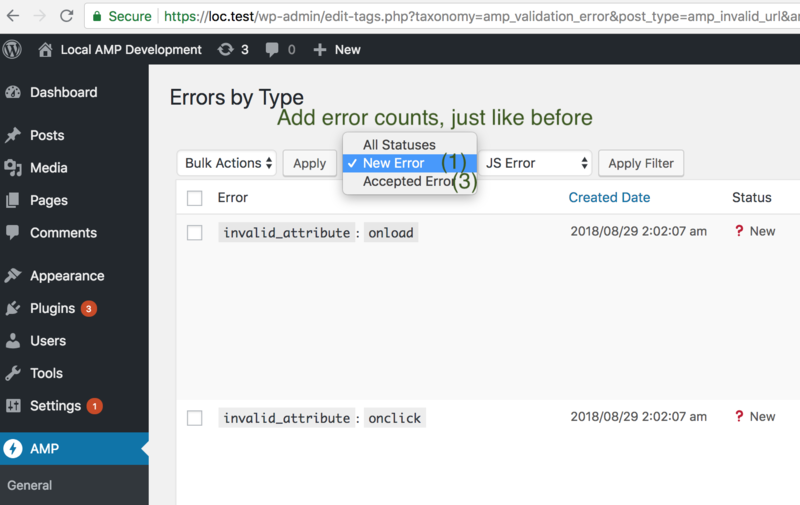 Borrowing heavily from add_group_terms_clauses_filter(), 3433791 adds a query var that can filter by error type on the 'AMP Validation Errors' taxonomy page. But this still needs the filter UI. edit-tags.php processes the POST request that this submits. Then, it redirects to a URL to display the page again. This filter callback looks for a value for VALIDATION_ERROR_TYPE_QUERY_VAR in the  request. That means that the user filtered by error type, like 'js_error'. 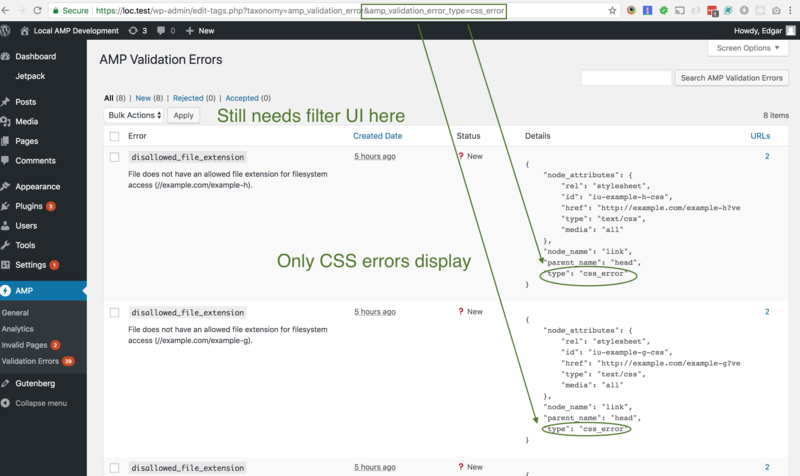 So that the taxonomy page will be filtered for that error type. @see AMP_Validation_Error_Taxonomy::add_error_type_clauses_filter() for the filtering of the 'where' clause, based on that query var. like only viewing JS errors. though work is probably needed for accepted status. as filtering by error type worked thanks to Weston. this uses much of their infrastructure. Also, it uses their counts for each status. this won't display the <option> for 'Accepted Error'. Create a new constant, NO_FILTER_VALUE. This is for the existing value of -1. And add this to the whitelist: in_array(). 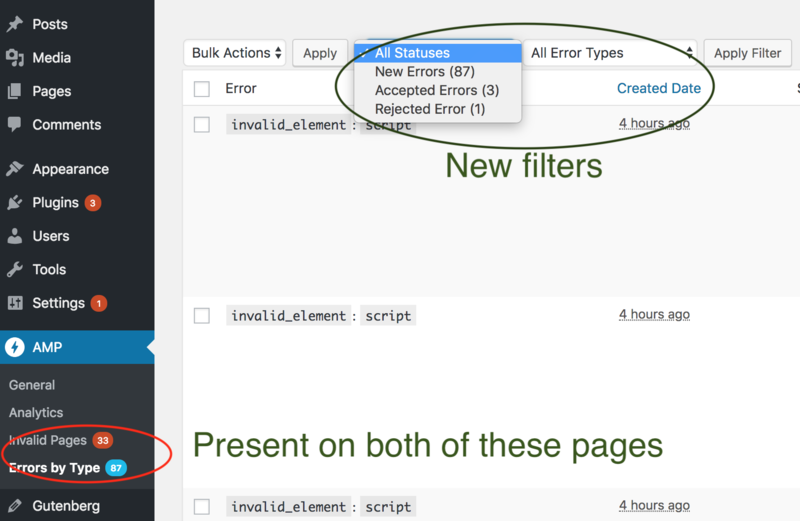 The UI to view errors by status is now in a <select> element ('All Statuses'), where it was before in <a> elements. This uses the existing work to filter by status, and merely applies it to the <select> as designed in this Sketch file. to match the Sketch design. Based on @westonruter's suggestion, I'll add counts to the error status <option> elements, like the counts that were present in the links before. when filtering by status was done by clicking an <a>. Mainly copy the previous logic to add the counts. caa2a26 applies the error counts, mainly copying the logic that was previously used for the <a> elements. Before, there was only HTML_ERROR_TYPE. 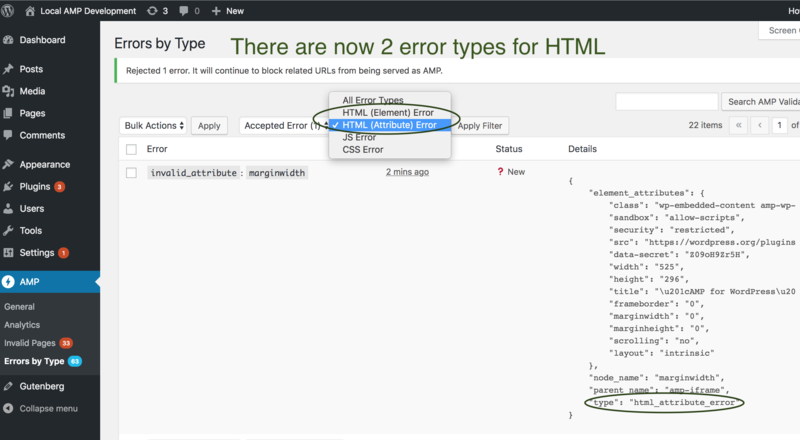 this adds 2 types of errors for HTML. So abstract it into 2 functions that can be reused. output the filter <select> elements on this page. like ensuring the query vars work. Look for the query var of the error type. And if that's present, add to the WHERE clause. and links to the post page (Errors by URL). Maybe it'd be better to search the amp_invalid_url post content for the correct error_type, instead of searching the amp_validation_error term description, like it does here. I think that's what you suggested here. Yeah, but what you've done here seems fine as well. simply return if the condition is false. Then, the remaining if blocks aren't nested. and pass that to the WP_Query if it's valid. This is how the text was when it was inside a link. and conditionally add the 'With'. which is for 'All Error Types' and 'All Statuses'. and it sometimes showed the same results as before. Improve inline documentation, address Travis error. especially when they needed to be updated. * On the 'Errors by URL' page, the <option> text should be different. * For example, it should be 'With JS Errors' instead of 'JS Errors'. This is not able to be properly translated. // The post page should have <option> text like 'With New Errors'. This is not properly translatable. Unfortunately, such variations in language require duplicating the entire strings.